I have a delicious zucchini recipe to share with you today! I don’t know about you, but I love finding new ways to use this versatile vegetable, and this quiche is definitely a new favorite. 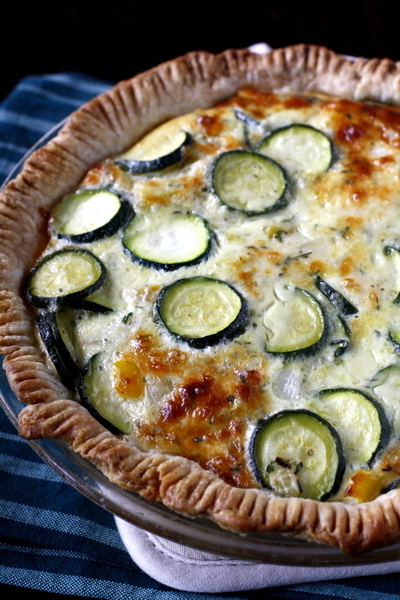 The crust is light and flaky, and the filling is chock full of zucchini and is wonderfully cheesy. We love zucchini, but I also think you could substitute other vegetables that you happen to have on hand. 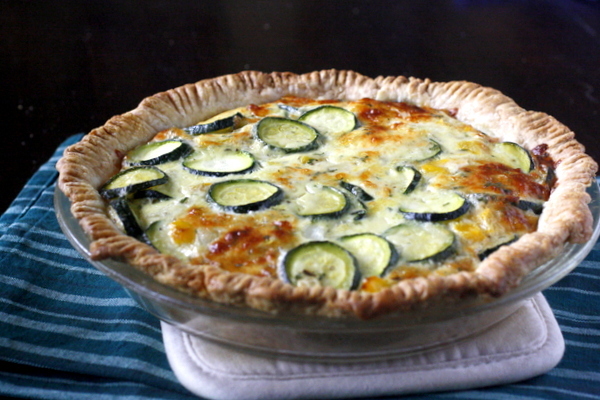 I didn’t have quite enough zucchini for the full quiche, so I added some yellow pepper and it turned out great. 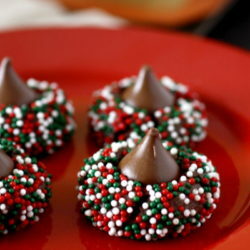 I love recipes that are somewhat flexible like that. 🙂 We ate this one night for dinner, and had the leftovers reheated in the oven the following night, and both times it was absolutely delicious. I would definitely recommend this recipe if you like zucchini. It was easy to make, tasted great, and reheated well – definitely a winner! Combine flour and salt in a medium sized bowl. 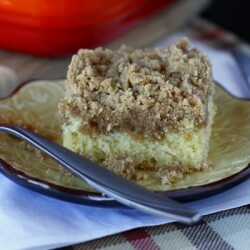 Using a pastry blender, cut in the butter until crumbly. Gradually add 3-5 Tbsp. ice water, tossing with a fork until dough holds together when pressed. 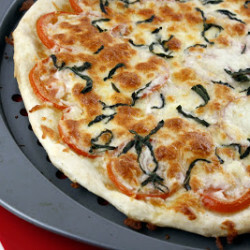 Roll out into a large circle and place in a 9-inch pie plate. Flute edge and refrigerate while preparing filling. Preheat oven to 400°. In a large skillet, heat butter over medium heat. Add zucchini and onion; cook and stir until tender. Drain and cool slightly. 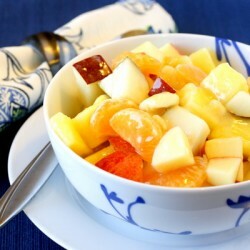 In a large bowl, whisk eggs, milk, and seasonings until blended. Stir in cheese and zucchini mixture. Pour into pie crust. Bake on a lower oven rack 35-40 minutes or until a knife inserted near the center comes out clean and crust is golden brown. Cover edge loosely with foil during the last 15 minutes if needed to prevent overbrowning. Let stand 10 minutes before cutting. 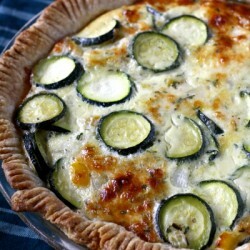 Quiche has been on my mind and this looks delish! On my menu to make right away! Thanks for making my day!